Tri-Bone Stable’s favored Effinex, whose strong year included a runner-up finish to Triple Crown champion and Kentucky Derby Presented by Yum! Brands (Grade I) winner American Pharoah in the recent $5 million Breeders’ Cup Classic (GI) at Keeneland, survived a five-horse battle through the stretch under jockey Mike Smith to win the 141st running of the $500,000 Clark Handicap Presented by Norton Healthcare (GI), the main event among three stakes events contested on Friday at Churchill Downs. Trained by Jimmy Jerkens, the New York-bred son of Mineshaft edged clear in the final yards to win the 1 1/8-mile race of 3-year-olds and up by three-quarters of a length over Mike Pegram, Karl Watson and Paul Weitman’s defending Clark Handicap winner Hoppertunity. It was the first victory in the race for the owners and trainer, and the second for Smith, who piloted Mi Cielo to win the Clark Handicap in 1991. The 5-2 favorite in the field of eight, Effinex returned $7, $3.60 and $3.20. Hoppertunity, the Bob Baffert-trained second choice under jockey Martin Garcia, paid $3.20 and $2.60. O’zbekiston Racing’s Looks to Spare, the longest shot in the Clark field at 88-1, finished a neck behind the runner-up in third under Victor Lebron and returned $10.80 to show. Donegal Racing’s Keen Ice rallied from last to finish a fast-closing fourth under Corey Lanerie, a head back of Looks to Spare. Matthew Schera’s Race Day, who led at the head of the stretch under John Velazquez and was part of the five-way battle through the final yards, finished fifth. 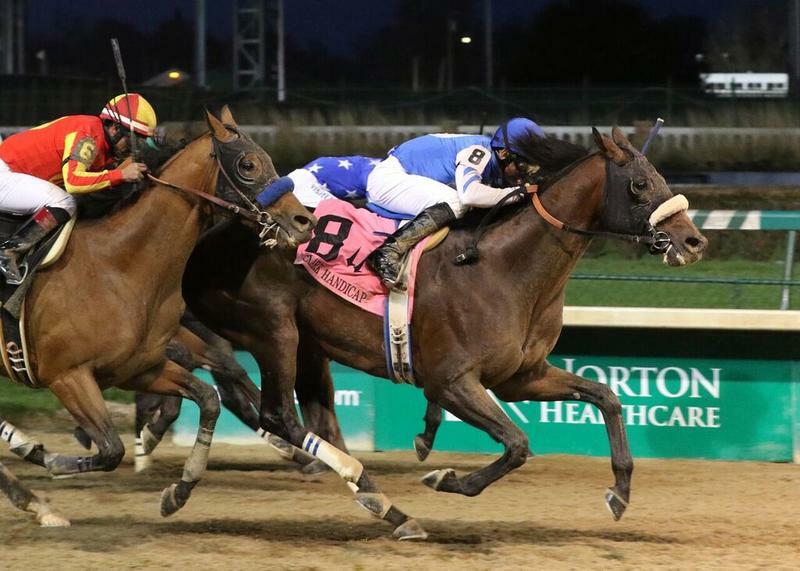 Effinex completed the Clark Handicap’s 1 1/8-miles in 1:48.92 over a fast track. The winning time was the seventh-fastest in in 61 runnings of the Clark at the current 1 1/8-mile distance, and was the fastest since the victorious A.P. Arrow covered nine furlongs in a winning time of 1:48.66 in the 2007 Clark. The two visits by Effinex to the state of Kentucky during the past month have been very profitable as Jerkens’ colt followed his second-place finish in the Breeders’ Cup Classic with a first-place Clark Handicap payday of $300,700. The victory boosted his career bankroll to $2,112,950 and improved his racing record to 7-2-3 in 20 races. 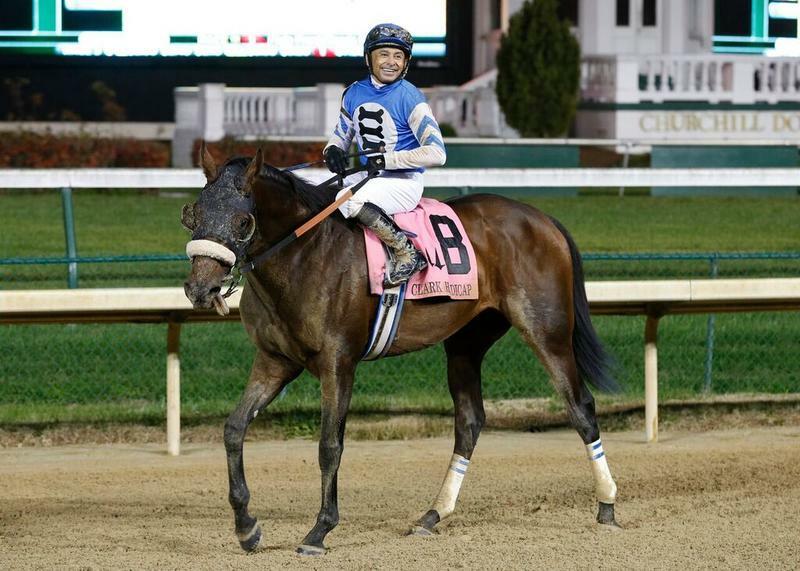 The Clark was his fourth victory in 2015 and third in stakes competition following victories in the Suburban (GII) at Belmont Park and the Excelsior (GIII) at Aqueduct, and the effort by his star justified Jerkens’ decision to return to Kentucky for the Clark. The Clark Handicap is one of four Churchill Downs stakes races that were introduced in 1875 during the inaugural racing meet at the Louisville track, which was known in its early years as the Louisville Jockey Club. 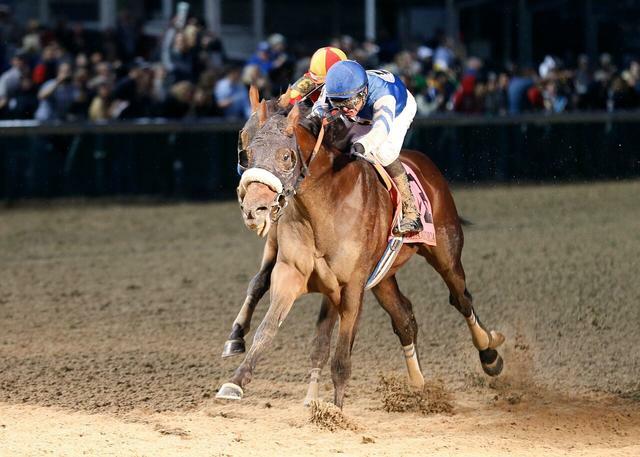 Like the Kentucky Derby and the Longines Kentucky Oaks (GI), the Clark Handicap has been run annually and without interrupted since that debut season. The other race that debuted in 1875 was the Falls City Handicap (GII), which celebrated its centennial running on Thanksgiving Day. Mr. Z and Shotgun Kowboy shot to the early lead in the Clark, while Effinex settled in fifth and Hoppertunity was seventh in in the run through the first turn. The front-running duo set the pace down the backstretch as Race Day and Effinex drew closer and Hoppertunity was settled in sixth and Keen Ice trailed the field. Race Day and Effinex moved quickly on the outside the early leaders who started to lose steam, while longshot Looks to Spare, who had lunged at the start, moved into a contending position and Keen Ice started a rally from the back the field. Race Day held a narrow lead over Effinex at the top of the stretch as Looks to Spare moved up from the inside and Hoppertunity swung seven-wide entering the stretch. Effinex moved to the front of that battle through the stretch as Keen Ice arrived late on the scene. Effinex edged clear for the final margin over the surging Hoppertunity, while Keen Ice just missed catching Looks to Spare for the show spot. The triumph by Effinex was only the second documented victory by a New York-bred in the Clark Handicap. Anticlimax, a New York-bred who won the race for Hal Price Headley in 1943, also was bred in the Empire State. Following fifth-place Race Day in the order of finish were 2014 Clark Handicap runner-up Protonico, Shotgun Kowboy and Mr. Z. The field for the Clark was reduced to eight by the scratch of Frivolous. Fall Meet racing at Churchill Downs enters its final two days on Saturday with a 12-race “Stars of Tomorrow II” program devoted exclusively to racing among 2-year-old Thoroughbreds. Post time for the first race is 12:40 p.m. (EST). JIMMY JERKENS, trainer of EFFINEX (winner): “He ran so well last time and it looked like he never missed a beat with his training and everything else afterwards so that’s why we decided to come. We broke a step slow and then they kind of converged on him and they went like a bat out of hell so he just sat there and went in behind them. “He’s just a good quality horse. He’s really come around since that weird effort at Saratoga where he went crazy from behind the gate. I still don’t know what that was about, but he’s been all business since then. He ran a hard race in the Breeders’ Cup, but he shipped all the way back on the van and acted like a fresh horse so we decided to come back. We didn’t really make a final decision until the week before. We were sure we could get Mike [Smith] to do it and we were sure that he wanted to come. We didn’t know what he had elsewhere but he definitely wanted to come so that helped us a little bit.